If You Are Expecting, It’s Not Too Early to Start Looking for Child Care. 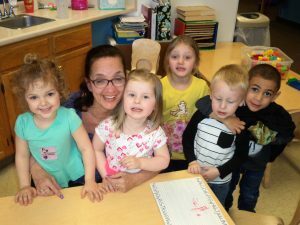 Child care centers, pre-schools, and nursery schools in the U.S. fill up early. But sometimes it seems there are so many — or so few — places to choose from, that you may not know where to start. Here are a few tips to guide you in the right direction. Care A Lot “Care” giver with a group of friends! For those of you who are expecting your first child, you’re probably already overwhelmed with many details; work, sleep, and family schedule. But you also should be making plans for childcare as early as you can. You don’t need to start making decisions as early as the first trimester, but it may be helpful to do some research on child care centers to see who has space, how long wait-lists are, and what sort of facilities are in your neighborhood that you feel comfortable with. One of the best ways to find the right center for you is to speak with other parents. Friends, neighbors relatives, or any other new parents who live in your area will be able to give you honest feedback about local child care centers that they’ve had experience with. Another easy way to learn about child care centers is to do a quick search online to find local facilities and reviews of each. So long as you have the time and energy, it’s a good idea to take a tour of various facilities as early as possible. You may think you have found the perfect center, but sometimes seeing the facility in person can change your mind. You’ll also want to ask about the educational standards of a given facility, for instance, asking whether they are a part of the QUALITYstarsNY program, which rates child care providers in New York State according to four categories: Learning Environment; Family Engagement; Qualifications and Experience; and Leadership and Management. Another thing to keep in mind is to check the facility’s layout, general safety, and “atmosphere” – does it feel warm and inviting? Do children generally seem happy and engaged? Are the play areas up-to-date and well-equipped? Do staff — even administrative staff — seem happy and interested? Are there enough personnel on the team for your child to receive individual attention when needed? The bottom line: researching, preparing a list of questions, and securing a space early is never a bad idea and can ease your family’s transition into child care. Want to know more about our childcare services? Simply find your preferred location and give us a call to set up a tour of our center. We’d be more than happy to show you around!